If you want to explore Budapest’s cultural and historical highlights easily, stay in the Downtown District (Belváros/5th District). You’ll be in the same neighborhood as some of the city’s essential historical landmarks, with shopping areas, street food spots, and restaurants within walking distance. Its central location makes for a comfortable and convenient base, especially if you’re visiting for the first time. If you’re looking forward to a holiday of sightseeing, dining, and relaxing (and want to steer clear of the city’s nightlife and busy areas), stay in the Castle District (Várkerület/1st District). You’ll be near the Budapest Castle Complex and will get to enjoy amazing views of the city. It’s great for sightseeing during the day, but also calm and quiet at night – an excellent base for experiencing a more refined side of Budapest. If you’re here for the fun and parties, stay in the Jewish Quarter (Erzsébetváros/7th District). This is the city’s lively nightlife district where you’ll find ruin bars, hip cafes, and cool brunch places. If you love lively, artsy neighborhoods filled with offbeat sights and hidden gems, stay in the Palace District (Inner Section – 8th District). This is a hip and up-and-coming neighborhood that has a more local vibe than the 7th district plus plenty of palaces and green spaces. It’s a great place if you want a slice of local life! If you want a totally relaxed stay away from the crowds, stay in Újlipótváros-Angyalföld (13th District). This one is way off the tourist grid, but near Margaret Island – a large island-park in the Danube. If you’re traveling with children or plan to stay for longer and get to know the city beyond its touristy sights, this is a nice residential place to make your base. Use this map to plan your trip to Budapest. You’ll find all the essential landmarks and best places to visit in the city, as well as the best neighborhoods and our top hotel recommendations in Budapest. You’ll find a little bit of everything in Budapest’s Downtown District. The Hungarian Parliament, St. Stephen’s Basilica, and the Danube boardwalk are within walking distance, and the Budapest Castle complex is just across the river. If you love to shop, you’ll find most of your favorite brands as well as local boutiques around Deák Ferenc. Some of the best spots for street food and local eats in Budapest are also here. If you’re in the mood for the sightseeing-shopping-snacking trifecta, this is an excellent base for you! This area enjoys a central and convenient location that’s well-connected by public transit. If you’re coming to Budapest for the first time and want to get a good lay of the land, this is where you should stay. Stay in the central downtown district to easily reach most of the city’s essential historical landmarks – for instance, the impressive Hungarian Parliament. ★Travelers’ Pick: Kempinski Hotel Corvinus is the best place to stay in Budapest if you’re planning to have a holiday packed with sightseeing, shopping, and (lots of) snacking. It’s right beside the Fashion Street, a short walk to the Danube, and near to the city’s food markets and restaurants. Apart from its convenient and central location, the hotel pampers its guests with stylish and comfortable rooms, great service, and a wide range of in-house restaurants. Double rooms start at EUR 195. If you’re looking for something more hip, check out D8 Hotel. Bright and stylish interiors make this hotel the perfect base for lovers of modern design – and it is right smack in the center of everything. Double rooms start at EUR 120. They also have bigger rooms for families and groups. The downtown is one of the most popular places to stay in Budapest, so if you’re thinking of staying here, make sure to reserve early. Here are some more amazing options in case Kempinski and D8 Hotel are fully booked: Hotel Parlement and La Prima. The Castle District is also a great base if you’re traveling to Budapest for the first time – but know that there’s one caveat: it lies on the Buda side of the city, which is quite far from the bustling Pest nightlife. Of course, if you much prefer quiet evening walks, soothing thermal baths, and gorgeous night views from the hills of the Castle District, then this is the perfect spot. During the day, you can easily cross the river to reach the busy centers and explore the rest of the city, but at night you’ll get to enjoy peace and quiet. This is the perfect base for intimate and romantic trips, for families, and anyone who’s looking forward to a calm and refined city break. Enjoy walks around the Budapest Castle complex, amazing views of the Danube from the Fisherman’s Bastion, and calm evenings in the city’s Castle district. You’ll also find plenty of gorgeous and homey boutique hotels in the Castle District – all designed to complement the beautiful and historic neighborhood. Check out these small hotels if you’re looking for a more personalized stay: Maison Bistro and Hotel, Pest-Buda Hotel, and Butik Design Buda. All three have lovely, warm interiors, comfortable rooms, and within walking distance of all the main sights. For larger groups, check out Andrassy Palace Residence, a chic apartment that’s perfect for a group of 6 up to 12 people. It’s spacious, contemporary, and equipped with most things you’ll need for a short stay. The apartment starts at EUR 290 per night. Budapest’s historic Jewish quarter is also the city’s lively nightlife district – this is where you’ll find the best ruin bars, clubs, and pubs. Dance and drink the night away and meet lots of fellow travelers and expats. At daytime, you can look for the vibrant murals that breathe life into the district’s scruffy streets or pop into an Instagram-worthy café. The district certainly has lots to offer all day and night. Accommodations in Budapest’s party district run the whole range – from posh hotels to charming boutiques, and of course, a lot of cheap and lively hostels. Love meeting travelers from all corners of the world and sharing stories over craft beers and cocktails? Budapest’s 7th district is your ideal base! ★Travelers’ Pick: Corinthia Hotel lies on the posh side of the 7th district – just outside the grungy parts of the nightlife district. You don’t have to worry about losing sleep (unless you want to) as you’ll find the hotel’s luxurious rooms and spas the perfect antidote to a day of serious sightseeing or a wild night out. Stay here if you want to be near the center of the city’s activity hubs but willing to splurge for a peaceful stay. Double rooms start at EUR 200. If you’d rather allot more of your budget on cocktails, Budapest’s Jewish Quarter has more affordable options. Check out KViHotel (a new, stylish boutique hotel), Blue Line Residence (an apartment good for up to four – perfect if you’re traveling with friends), and The Hive Party Hostel (the name says it all!). Want a slice of local life? If you want a glimpse of what Budapest is like for those who live there, stay in the Palace District. It’s just a little bit off the tourist centers, but still close enough to be a comfortable and convenient base. This is where a huge chunk of the city’s student population lives, so you’ll get to enjoy better rates on apartments, as well as a fresh selection of restaurants, alternative bars, and a growing café scene. Make sure to stay within the 8th district’s inner section, though. You’ll be within the vicinity of the National Museum, well-maintained gardens, as well as plenty of beautiful palaces. Take time to smell the flowers and fresh air in Budapest’s Palace District. This lively, artsy neighborhood is your best base if you love offbeat attractions, alternative bars, and a growing café scene. ★Travelers’ Pick: PuraVida Apartments is the best base for you if you really want to soak up the local living experience in Budapest’s 8th district. It’s your home away from home – just off the city’s touristy streets so you can come home to a relaxing space, but near enough to everywhere to make your stay convenient and comfortable. The apartments are spacious with bright, cozy interiors and furnished with most things you’ll need for a short stay. Studio apartments for two start at EUR 65, while bigger apartments for four are at EUR 105. These apartments get snatched up pretty quick, so either book way in advance, or check out these other fantastic options: Budapest Passage 1, Three Corners Hotel Anna, and House Beletage. If you’re looking for something more fitting to the name “Palace District,” check out the glitzy Hotel Palazzo Zichy. Here’s where you can spoil yourself on elegant ambiance, luxurious rooms, and wonderful amenities – at a fraction of the price you’ll get them for in the more touristy neighborhoods. If you want to stay way off the tourist grid, stay in the 13th district. Note that this is not ideal if you’re coming to Budapest for the first time and plan to stay just a couple of days. But if you’ve seen most of the essential landmarks and just plan to veg and chill, then this district is great for doing just that. This district’s main draw, though, is its proximity to Margaret Island – a large island-park in the Danube. If you’re traveling with children or plan to stay for longer and get to know the city beyond its touristy sights, this is a nice residential place to make your base. Enjoy a day or two in Margaret Island, Budapest’s island-park. If you’re traveling with kids or just want to veg and chill, the nearby district has a nice residential vibe that will make you feel right at home. ★Travelers’ Pick: Adina Apartment Hotel lets you have the best of both worlds – a spacious, furnished apartment where you can relax and feel at home, plus amazing hotel amenities like an indoor pool, gym, and a breakfast buffet. It’s in the 13th district’s quiet residential area just a few minutes’ walk to the Danube and to Margaret Island – perfect for families with children, or nature-lovers wanting a lowkey city break. Here are other apartments hotels you can check out – they’re all near the Danube and great for families and other small groups: Unique Studio at the Danube and Arriva Apartments. If you’re up for a really unique experience, stay on a boat! Vogue Apartments is a ship anchored on the Danube River and offers spacious rooms with killer views. Tell us: Where will you be staying on your holiday in Budapest? Look for me in the Jewish quarter's ruin bars, clubs, and pubs! Staying way off the tourist grid and living like a local in Újlipótváros-Angyalföld! Getting around – Budapest’s landmarks and sights are spread out across the city, but it’s easy to get around. I added all the top recommended sights, restaurants, shops, and hotels in the Google map above (click to scroll to map) so you can get around the city easily on your own. You can also use Google maps to find public transportation routes. The city is extremely walkable and serviced by all kinds of public transportation. You can buy tickets from subway stations and vending machines which you then need to validate when getting onboard. You can buy single tickets (HUF 350/~EUR 1) or a discounted book of 10 tickets (HUF 3,000/~EUR 9.5). Alternatively, you can get the Budapest City Card for unlimited rides around the city, free walking tours, as well as free entry and discounts to museums, restaurants, and attractions. Another quirky but nonetheless fun way to get to the main sights is by going on the Hop-On Hop-Off Buses. Currency – Hungary’s official currency is the Hungarian forint (HUF). While it’s possible to pay using euros in some establishments, the conversion rates used are often not in your favor. Also, small shops and restaurants don’t accept cards, so you’ll need to carry around some cash as well. When withdrawing from ATMs, choose the ones in large banks. The other ATMs you’ll find placed around the city charge exorbitant fees, sometimes hidden as an unfair exchange rate. If you can, get a TransferWise Borderless Mastercard before your trip and enjoy much better conversion rates. You can then use it in establishments without an additional international or conversion charge and withdraw from all the major banks’ ATMs for free. Planning an exciting holiday around Central Europe? Here are our neighborhood guides and itineraries to amazing destinations around Budapest. Hop over to Austria and the Czech Republic. You’ll love exploring these Central European capital cities. Make the most of your holiday by choosing the best neighborhood for you! From lively cities to charming villages, Central Europe is packed with amazing destinations. Whether you’re in the mood for urban adventures, countryside road trips, or lazy mornings by the lake, these itineraries and travel guides will get you inspired and organized. Enjoy the perfect mix of classical landmarks and local gems. The perfect itinerary for first-time visitors – this includes a self-guided walking tour in Prague plus a side trip to Cesky Krumlov. Up for an adventure? 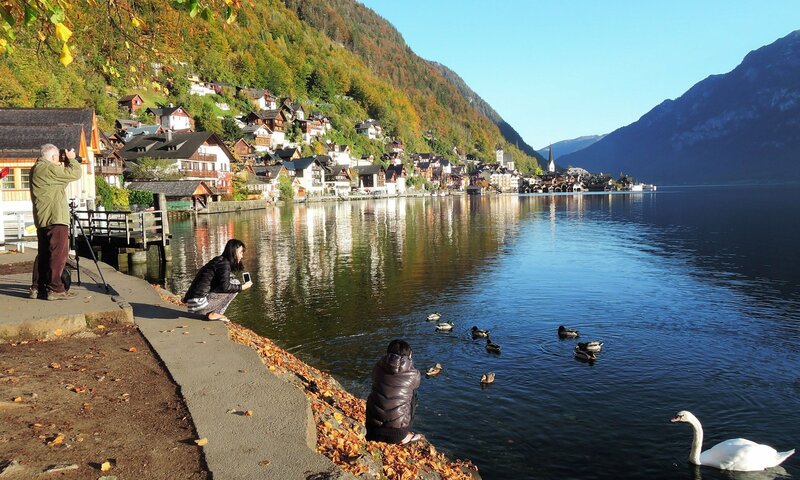 Drive from Vienna to Salzburg through beautiful landscapes and charming lake towns. If you’re craving for some downtime in a beautiful location, make your way to South Moravia and enjoy stunning natural landscapes, delicious wine, and historic castle towns. I hope this guide helps you plan your trip to Budapest, Hungary! This amazing city has lots to offer and truly caters to all kinds of travelers. Whether you’re looking for a romantic holiday, a fun trip for your family, a cultural tour, or a wild weekend with your best buds, there’s a neighborhood in Budapest that’s perfect for you. If you found this guide useful, please share with your friends. If you need more information, get in touch, and I’ll do my best to help you out. Happy travels to Hungary! I love that you found a spot in each district.